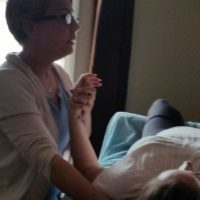 Have you taken Lin Roussel’s Basics of Cranial Sacral Massage l and ll classes and haven’t had time to practice? Have you forgotten pretty much everything you have learned? Do you think you could use a refresher on Grounding Techniques and how to deal with emotional release? Have you forgotten your hand placements for the Three Comfort Holds, Assessment Techniques, and/or Full Body Sequence? Don’t worry! Come to this hands-on workshop and brush up on all you have learned before plus some new stuff! Please bring your folder from your last classes, have short nails, and wear comfortable clothing – long pants but no jeans, and bring socks. Class size is limited!